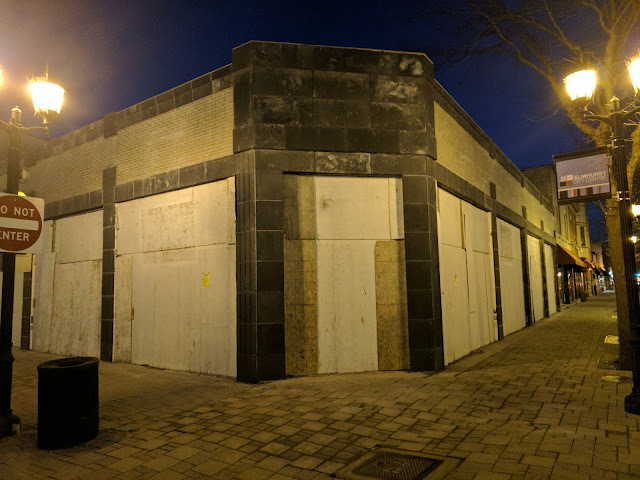 Back in December of last year, there was finally a flurry of activity on the structure that sits at the northwest corner of First and York (just on the north side of the tracks) in the Elmhurst City Center. I covered it here on the blog and at that time, Alderman Dannee Polomsky of the 3rd Ward shared that there was a new business going into the spot called Beerhead Bar & Eatery. If you head to the Beerhead site, they now even have a page up for the Elmhurst location. For the better part of the past 60 days, there has been scaffolding up on both sides of the building as they do some exterior work on the facade, but as I walked by it earlier this week on my way to the train, I noticed the scaffolding was all gone. And the building looks great! They added some black stone to the top and down the sides and cleaned up the brick it looks like to me. The building, which if you look back thru the archives was a hodgepodge of a bunch of different uses including Polay's interior designs, Meeder remodeling and that store that sold kids clothes. And in December of 2015, they posted the plans for what would eventually become what we see here. December of 2015! That's more than 2 years ago. Development moves at a glacial pace sometimes, it seems. If you walked by when they were doing this interior work, you could see that the interior was totally gutted, so they still have a bunch of work to do I would think. But, maybe by the end of Spring, we'll have another beer place in town? What's that, now...3? The old trend that was all about yogurt places is the new craft beer place, I guess?